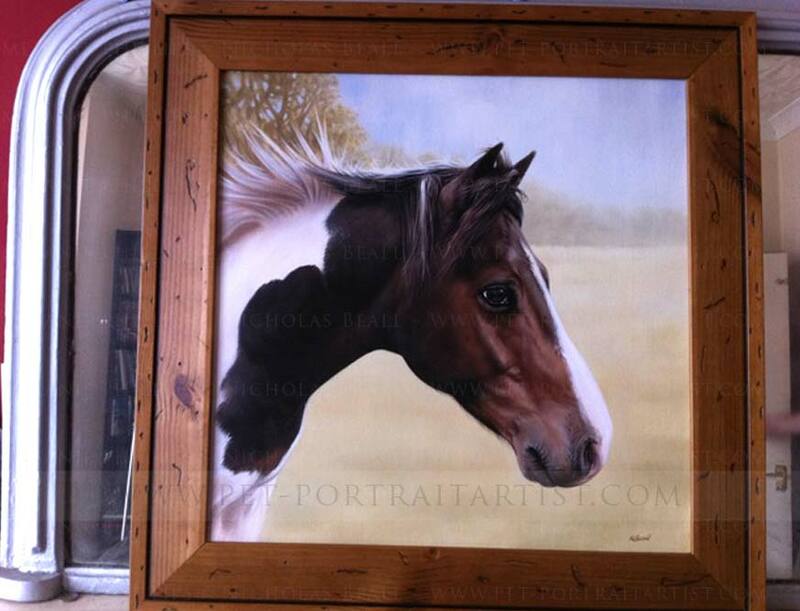 Sam and Simon Browne contacted Nicholas in 2012 to see if he would be able to paint a horse oil painting for them of their beautiful pony Murphy. Sadly Murphy passed away from cancer only a few months prior and their family were devastated. Sam and Simon decided that commissioning a painting of Murphy would be a perfect way of remembering Murphy. Nicholas was able to use their favourite photo as the main pose and remove the gate and fence behind. He used a few others for colour and detail too. 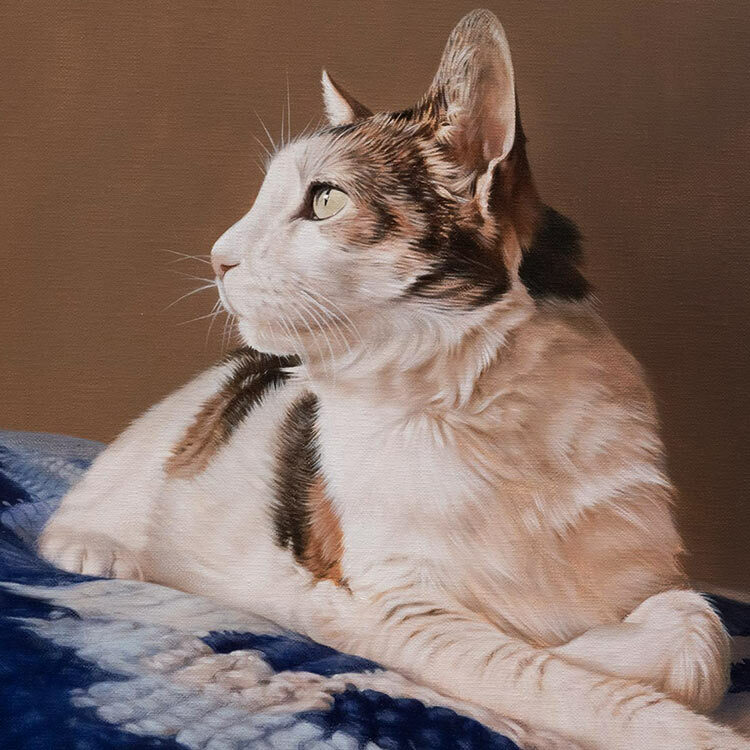 The painting was completed by Nicholas using traditional oil paints on Italian Linen stretched canvas at 16 x 16 size. We have all of our canvases made professionally and so we can order any size that fits within the composition of the photo and our clients requirements. 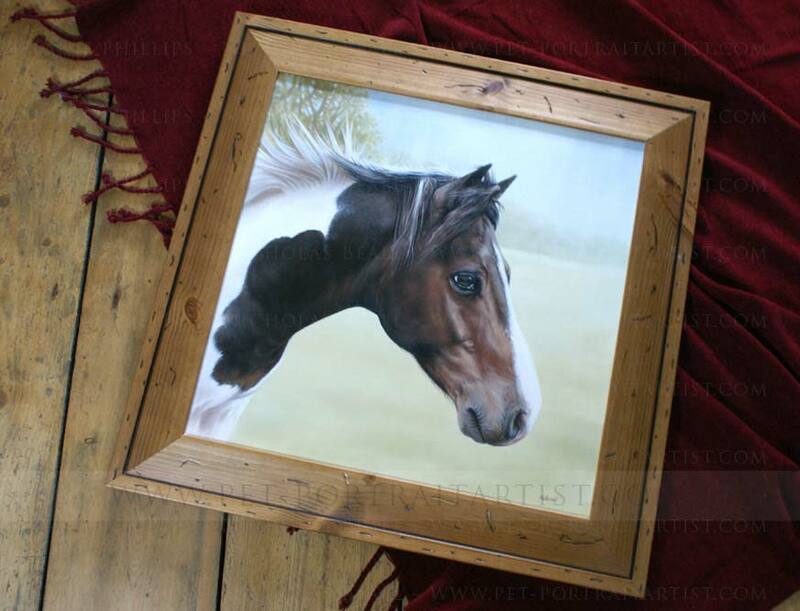 So even if you don’t see a particular size on our Horse Portraits Prices page, we probably can create it for you! We hope you like the results of Murphy’s oil painting. It is certainly a portrait the whole family will really treasure for a very long time. Oh Wow! I can't believe I can see Murphy looking back at me - he looks lovely - thank you! Just to say that Murphy's portrait arrived safe & sound (wow very impressed with the wrapping - so was our dog who enjoyed the bubble wrap - lol). This isn't going to be his hanging place, (see photo below) I'm just enjoying looking at it from the sofa at the moment - I feel I'm going to have to re-design the living room now and nag my poor husband about putting the new fireplace in ;0) He will look wonderful just above it. We all can't get over how lifelike and warm the painting is, and it has this amazing 3D quality you just don't get with a photo (I'm not sure if that best describes it) after missing him so much over the last few months, it's almost as though he's in the room with us. The size is perfect, near enough life size - it reminds me of him looking back through the stables. Nick, I think I just haven't seen anyone else capture a 'soul' in a painting like you have done. Once again, thank you so much - I will send pictures once we eventually have it put up properly. 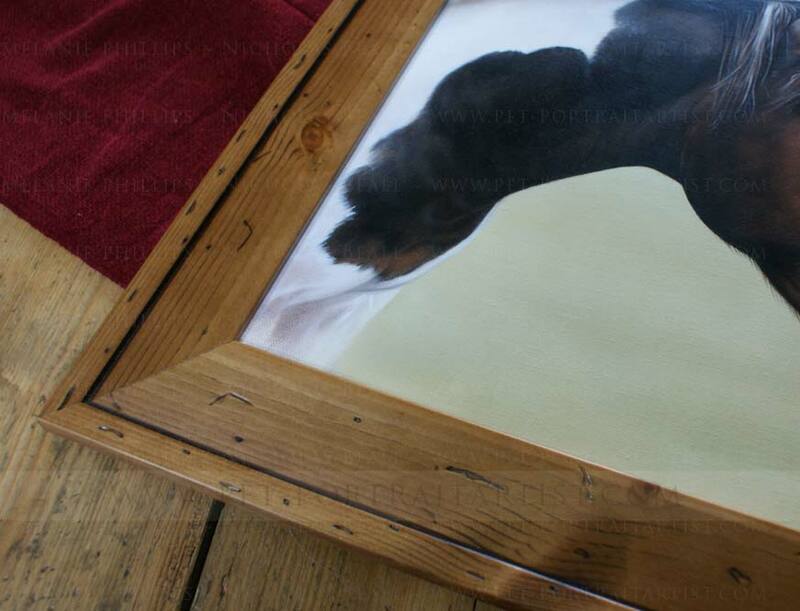 Sam asked our framer to frame the portrait of Murphy and you can see the results below. You can also see a photo taken by Sam when the portrait arrived. I believe it will be displayed over their fireplace, which is wonderful! A forever reminder of their beautiful horse Murphy. 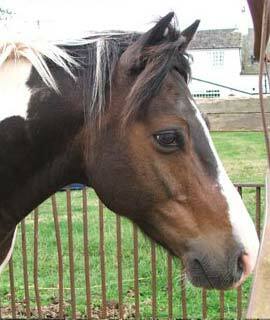 We are always sad to hear when horses pass away. The only comfort we can bring to our clients is the paintings we create for them. It goes some way to heal them, knowing they can see their horses on canvas each day, remembering all of the fun times and wonderful memories they shared over the years. There are most often tears with sadness and joy when they receive the paintings. 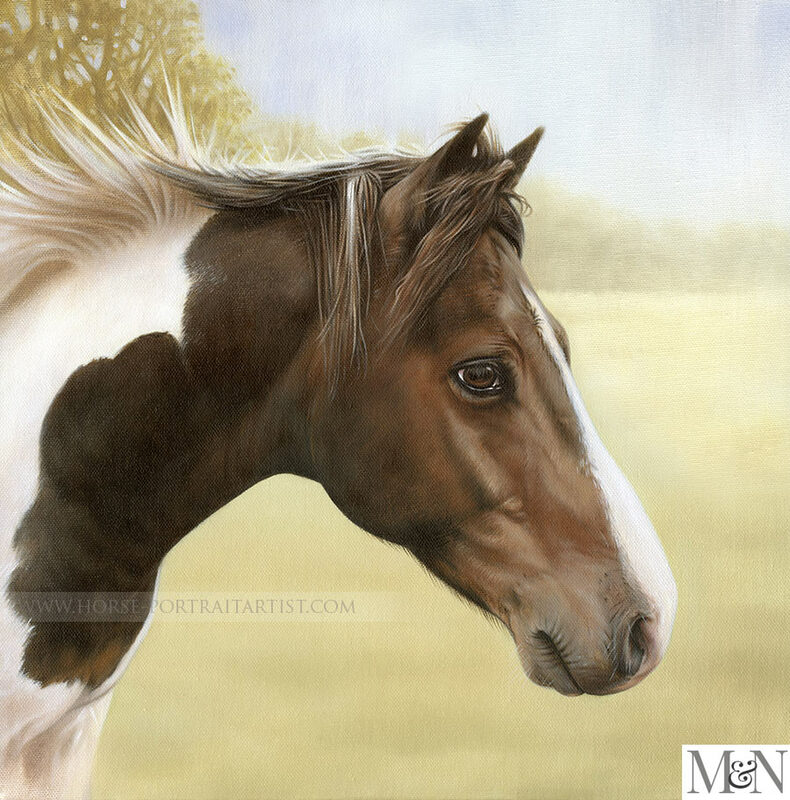 If you have lost your horse and would like a portrait of them, you are more than welcome to email us at any time from our Horse portraits contact page.